Aspen—and the entire Roaring Fork Valley—is the epitome of a hiker’s paradise with a system of trails for all abilities. Whether it’s the multi-night trek across the Four Pass Loop for experts or a paved path for beginners, the scenery through fields of wildflowers, across rushing streams, or deep into a dense forest will stay with you forever. While you can find endless options for day hikes and backpacking trips surrounding Aspen, the quintessential quick locals hike is Smuggler Mountain, which is usually done during lunch breaks. But since you have all day on vacation, head down the backside after posing for an obligatory Observation Deck photo and pick up the Hunter Creek Trail, which ends just down the street from where you started. The Ute Trail is another in town favorite, but takes a little more stamina to master the steep switchbacks. If you’re in great shape, take it all the way to the top of Ajax (what locals call Aspen Mountain) for lunch al fresco. And don’t worry…you can ride the gondola down for free. Visit Aspen Trail Finder, one of our favorite local sites, for an in-depth database of all area hiking trails. Our Hiking Guide listings can assist you if you would rather go with a guide than go it alone. Elevation: 7,700 ft. - 7,900 ft. This is both a hiking and biking trail. The trail starts behind the Post Office on Puppy Smith Road. The first two miles of the trail are paved and then becomes a dirt trail after crossing Cemetery Lane. Elevation: 8,900 ft. - 10,400 ft. The trail begins just east of the apartments on Lone Pine Road or directly off of the Rio Grande Trail extension. This is a gradual uphill climb along Hunter Creek towards Hunter Valley. To access the upper trail, drive north on Mill Street, veer left onto Red Mountain Road and follow for 1.1 miles to Hunter Creek Road. Turn right onto Hunter Road and follow the signs to the parking lot. Upper portions of the trail pass through alpine meadows scattered with several abandoned homestead cabins. Miles one way: 6.5. This trailhead accesses Smuggler Mountain Road, one of the most popular recreation areas in the immediate Aspen vicinity. Any spring, summer or fall afternoon, Smuggler Mountain Road is busy with Aspenites hiking, running, mountain biking or walking their dogs. Smuggler Road provides a short (1-1/2 mile) workout with great views of Aspen from the look-out point, which makes it very popular. You can access the Hunter Creek Trail or continue to Warren Lakes. Elevation: 8,000 ft. - 10,000 ft. The first part of the trail contains a series of switchbacks through sagebrush and scrub oak. About 1 mile along the trail, you will cross a driveway then continue on to Red Mountain. The trail finally joins with the Hunter Creek Trail in the Hunter Creek Valley. As there are many spurs that can lead to one getting lost, a topographical map is recommended. Miles one way: 6.3. The trail starts close to town on Ute Avenue. The sign for the trail is approximately 0.4 miles up Ute Avenue on the right if you are headed east. It is steady uphill with switchbacks, 0.9 miles and 1,000 vertical feet to a rock outcropping. The view of Aspen from the rock outcropping is spectacular. A mile long aerobic workout. This trail is accessed off of Cemetery Lane and is a quick but difficult trail with amazing views. If you aren't up for the challenge, enjoy the view from our 360 Tour of Red Butte. One way, the trip is about 0.6 miles. The old town of Ruby is an abandoned mining camp. Drive east on Hwy 82 for 11 miles to the Lincoln Creek Road turnoff. Follow the dirt road 6 miles to Grizzly Reservoir. At this point the road becomes a four-wheel drive road. You can begin your hike here. The road continues 5 miles to the ghost town of Ruby. The hike begins at about 10,400 feet in elevation. This trail is located approximately 13 1/2 miles east of Aspen on Hwy 82 on your right. This is designed to give the blind hiker a feel for the outdoors. Twenty-two messages are provided along the trail in both Braille and in print. Nylon cord guides are provided for the blind. The hike is 3.6 miles (one way) in length with an elevation gain of 2,000 feet. A moderate hike until the end where you have 1/4 of a mile of switchbacks. Elevation: 10,300 ft. - 12,300 ft. The trail is 3.9 miles one way. Tabor Lake is accessible from this trail about 1/2 mile to the west. Elevation: 11,200 ft. - 12,200 ft. The trail follows an old jeep road and will end with Anderson Lake 1/3 of a mile to the left and Petroleum Lake 3/4 of a mile to the right. The total hiking distance to Petroleum Lake is 1.8 miles one way. Miles one way: 8.9. Elevation: 10,500 ft. - 12,800 ft. Miles one way: 8.8. Elevation: 9,900 ft. - 11,900 ft. The trail connects with the Hunter Creek Trail that eventually will take you back to Aspen (20 miles). A topographical map is mandatory! Elevation: 10,000 ft. - 12,300 ft. The length is 4.2 miles one way. A topographical map is mandatory - it is easy to get lost. Miles one way: 9.7. Elevation: 8,600 ft. - 11,600 ft.
Elevation: 8,500 ft. - 12,500 ft. The trailhead begins 7 miles past the town of Lenado. Lenado is about 10 miles east of the Town of Woody Creek. Length is 3.4 miles. Miles one way: 8.5. Elevation: 8,500 ft. - 12,500 ft. The natural Hot Springs is at the end of a gently rising 8.8 miles. Camping around the Hot Springs is limited and as of 2018 a permit is required. If continuing up Triangle Pass, you can connect with the East Maroon and Copper Passes, or continue approximately 10 miles further to Gothic at Crested Butte. This was once a popular old wagon road to Crested Butte. This trail, which is also a 4-wheel drive road, begins off Castle Creek Road about 1 3/4 miles beyond the ghost town of Ashcroft. The road starts to the right, continue about 3 1/4 miles until a fork is reached. Veering to the left will take you to the top of Pearl Pass (4 1/2 miles). The right fork leads to Montezuma Basin. Miles one way: 3.2. Elevation: 9,400 ft. - 11,400 ft. The trail rises steeply and then follows a series of switchbacks for the first 1 1/2 miles. Then the trail levels off with gentle rises until you reach the lake at 3.2 miles. Miles one way: 3.5. Elevation: 9,500 ft. - 11,866 ft. The trail climbs steadily and then reaches a series of switchbacks followed by a marked fork. Take the left fork to Cathedral Lake for a total hike of 3.2 miles. Cathedral Lake is very scenic with fair fishing. If hiking to Electric Pass, it is advisable to start early and descend by Noon, as lightning storms are likely to occur in the afternoon hours. Miles one way: 1.3. Elevation: 9,500 ft. - 10,000 ft. The trail follows the lake to the far side and meanders along the creek flowing into the lake. This is a great place for pictures and picnics. The trail begins at Maroon Lake, 10 miles up Maroon Creek Road. The Maroon-Snowmass Trail climbs through the Aspens to the lake. The left trail or the scenic trail follows a river and crosses two bridges, then climbs steeply to meet with the Maroon-Snowmass Trail. Distance to the trail is 1 3/4 miles one way. Miles one way: 8.5. Elevation: 9,000 ft. - 12,000 ft. Miles one way: 6.2. Elevation: 10,000 ft. - 12,500 ft.
From the top of the pass, the trail descends to the Frigid Air Pass, and Schofield Park out of Crested Butte. The hike to Crested Butte is about 12 miles. The top of the pass is tricky and steep. The soil can be slick if it is wet. The total distance is 4.6 miles one way. After about 1/2 mile above the tree line is the Maroon-Snowmass and Willow Lake junction. Take the left fork that ascends steadily to Buckskin Pass. The total hiking distance is 6 1/2 miles. Follow the directions to Crater Lake. Then at the Crater Lake bulletin board, take the right fork. The trail ascends steeply. After about 1/2 mile above the tree line is the Maroon-Snowmass and Willow Lake trail junction. At the junction, take the right fork. The trail ascends steeply to the top of Willow Pass. From the top of the pass, the trail descends to the junction with East Snowmass trail. Continue straight on the trail for the last 1/2 mile to the lake. Miles one way: 6.8. Elevation: 9,400 ft. - 11,400 ft. The trail begins a short distance up Maroon Creek Road at Islen Park behind the tennis courts. It continues across the river to Buttermilk Mountain. The total trip of 7 miles (one way) to Snowmass Village winds through wooded areas and meadows. This is a pleasant hike after a steep beginning. Hikers MUST be careful to stay on the trail as it crosses private property. Miles one way: 8.2. Elevation: 8,400 ft. - 12,600 ft. This trail is a fairly steep hike and goes through varying terrain along East Snowmass Creek. The round trip is about 17 miles with an elevation gain of 4,200 feet. A virtual tour from the top of Aspen Mountain, where you can hike, eat lunch at the Sundeck, play frisbee golf, or even get married. A virtual tour of the Grottos and Ice Caves off of Highway 82 heading up Independence Pass. Great place for a day hike and picnic. A virtual tour of the most photographed peaks in North America. 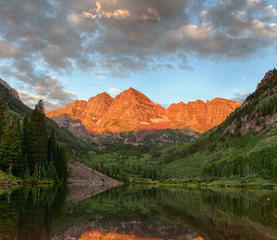 Plenty of hikes for all abilities at the Maroon Bells. A virtual tour of one of the most accessible hikes from downtown Aspen. A virtual tour from the Ghost Town close to the top of Independence Pass and the Continental Divide. A virtual tour of this quick & difficult hike to a stunning view of the Valley.